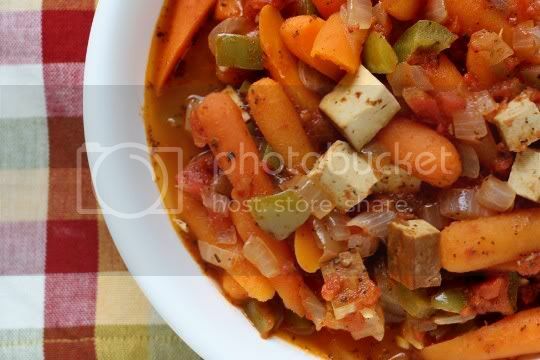 Picture this veggie-packed stew being served after a long day's work, to a family sitting around a wood-burning stove in a warm rustic kitchen. It's a simple dish: just veggies cooked in a simply spiced, tomato-based broth. But somehow, the flavors become so intense, and a fresh bowl of this cacciatore warms not only the hands but the soul as well. It's the epitome of the Italian countryside. And although no animals were harmed in the making of this meal, this "hunter's stew" is hearty, meaty, and satisfying. This stew takes a while to cook, but the prep and cooking are super simple, easily making this a one-pot wonder meal. 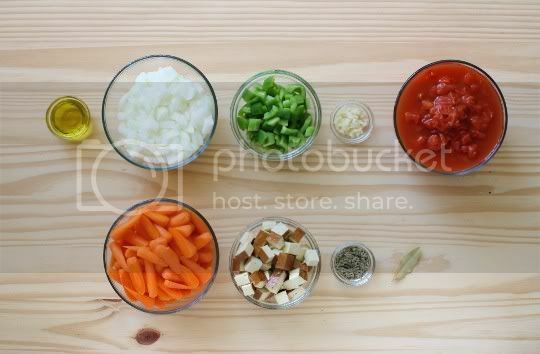 Saute onions, bell peppers, and garlic, then add tomatoes, carrots, tofu, sage, and a bay leaf. The amount of carrots may seem overwhelming, but it all works in the end. Make sure you use baked tofu as opposed to the fresh, water-packed kind; you'll be cooking this for an hour, so you don't want it to fall apart. 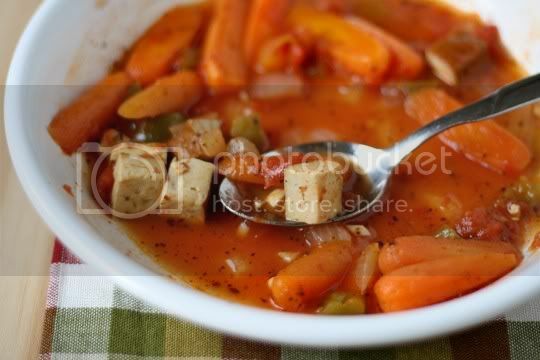 Simmer, stirring occasionally, and you've got a delicious entree ready to serve immediately. Clearly, carrots are the main star in this dish, but for good reason. They add so much sweetness to the stew, which is a great complement to the tangy tomatoes and pungent onions and peppers. The carrots are perfectly cooked, slightly firm yet tender. 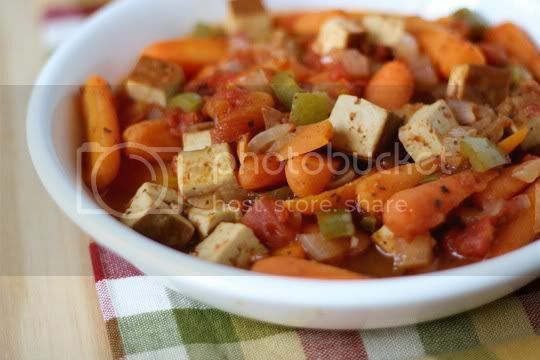 The tofu is super chewy and meaty, and nicely soaks up all the veggie flavors. Only salt and pepper are needed for additional seasoning, as the strong woodsy note of the sage takes the forefront. This stew is surprisingly hearty on its own, but the meal is completed served over a starch: linguine, farfalle, or rice, although I think any smaller pasta shape would work well for the ease of eating. Or, serve a nice hunk of garlic bread on this side, which can be used for stew-sopping double duty. Make again? Yes. Simple, tasty, and even better leftovers.